Like other plastic forming processes like extrusion and injection molding, rotational molding involves the heating of plastic beyond its melting point in order to shape the plastic into a useful product. Although extrusion and injection molding are similar on many levels, rotational moulding is among the most distinct plastic shaping processes. The process is used to create hollow, often large plastic products like tanks and even light watercraft hulls. Rotational moulding can also be used to create small plastic products in large quantities. Sporting equipment, plastic construction indicators like cones and pylons, trash collection bins and even garden flamingos can all be produced by rotational moulding processes. A wide variety of industries make use of rotationally moulded plastics. The construction industry, manufacturers, warehouses and many other operations require rotationally moulded plastic products for many purposes. Rotomolded products are also widely used in commercial contexts and in consumer products markets. Rotational moulding is valued because of the consistency with which it can shape plastic products and its aptitude for creating short product runs easily. A rotational moulding machine may seem elaborate, but its principle of operation is quite simple. A rotational moulder involves a mold, a heat source, a collection of raw plastic, mold movement machinery and cooling equipment. At the beginning of the process, raw plastic material is loaded into a half-constructed hollow mold. Once the plastic is loaded in, the mold halves are joined together, sealing the plastic inside. The mold is then heated, causing the plastic to become molten. Many plastics, when molten, are easily formed and will keep their shape upon cooling. Such plastic varieties are called thermoplastics and include polyethylene of high and low densities, PET, PVC and many other materials. In order for the molten plastic to take the shape of the mold, the mold is rotated by arms or other equipment that causes the molten plastic to come into contact with all of the surfaces of the mold. 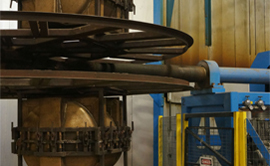 Once the plastic has coated the mold, the rotation slows and the mold is subject to a cooling process. Once cooled, the plastic is ejected from the mold as a newly rotationally molded plastic product. If necessary, the product can be sent for further processing like cutting and painting, or it can be prepared for shipment to customers. Rotational Moulding Rotational moulding is a plastic forming process used to create hollow plastic products. Rotational moulding is also sometimes referred to as rotomolding, rotomoulding, plastic rotational molding and some other names.